What To Expect From Friday's Summit Between North And South Korea : Parallels "President Trump is in for a rude surprise if he thinks ... Kim Jong Un is going to say, 'Sure, I'll hand over my nuclear weapons,'" North Korea expert Jean H. Lee tells NPR. 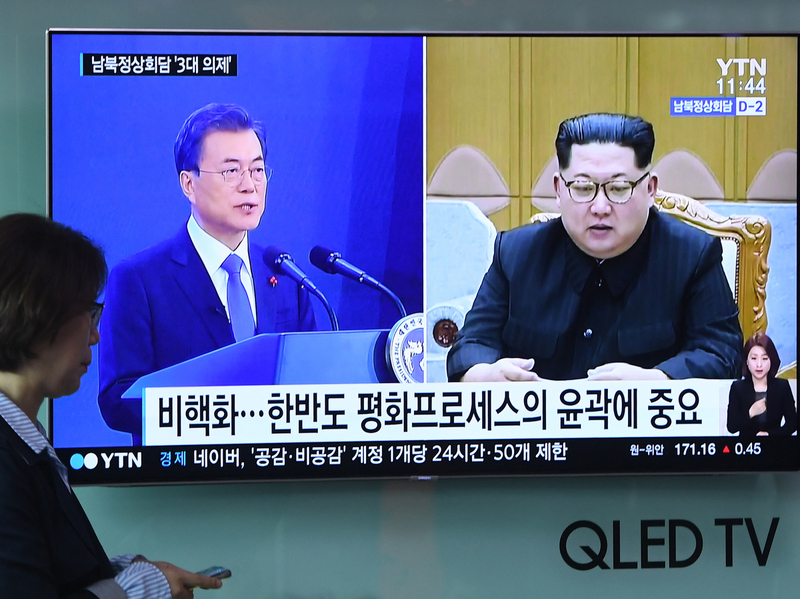 A woman walks past a news screen showing file footage of South Korean President Moon Jae-in and North Korean leader Kim Jong Un at a railway station in Seoul this week. Kim will walk across the Demilitarized Zone on Friday for a historic summit with Moon. The presidents of North Korea and South Korea are scheduled to meet this Friday, in a prelude to a summit in the works between North Korea's Kim Jong Un and President Trump to talk about North Korea's nuclear program. The summit between Kim and South Korean President Moon Jae-in will be the third time the countries' top leaders have met since the Korean War. Trump's meeting with Kim is expected to occur next month. But there's reason for caution when it comes to expectations about North Korea, warns Jean Lee, director of the Hyundai Motor-Korea Foundation Center for Korean History and Public Policy at the Woodrow Wilson Center. Kim's understanding of "denuclearization" of the Korean Peninsula — a key U.S. goal — may be very different from what President Trump expects, says Lee, the former Pyongyang bureau chief of the Associated Press. I think President Trump is in for a rude surprise if he thinks that he's going to come to this summit with Kim Jong Un and that Kim Jong Un is going to say, "Sure, I'll hand over my nuclear weapons" — because that is certainly not the case. What Kim Jong Un has said is that he supports this concept of a nuclear-free world and that he is willing to discuss the denuclearization of the Korean Peninsula. And so the U.S. may think that that means forcing or requiring North Korea to give up its nuclear weapons without anything from the U.S. side. But North Korea has very consistently said that that, for them, means that the United States also has to give up its nuclear umbrella over the Korean Peninsula and in the Northeast Asian region. This [inter-Korean] summit will roll out differently, I think, than the anticipated summit between President Trump and Kim Jong Un because the North and South Koreans have been preparing for it very methodically, step by step. What we will see is a strong show of unity between the two Korean leaders. This is something that will play well in Pyongyang — for Kim Jong Un to show that he's got the South Korean leader on his side. The South Koreans will certainly want to discuss denuclearization and discuss the upcoming summit with Donald Trump, and perhaps try to pave the way and lay the groundwork for that summit. They will most likely come up with some agreements at this meeting, perhaps some agreement on reducing the military tensions along the [Demilitarized Zone] and also perhaps some agreement on restarting the family reunions of those Koreans on both sides of the DMZ who hadn't seen each other in more than 65, 70 years. You know, when you tell your people that they are under threat from an outside force or that they are at risk of being attacked, for any country, that brings the people together. And that's what ... North Korea has been doing to its people, is telling them, "We are under threat, we are under attack, and so we need to come together." But the big thing that Kim Jong Un wants is to have a resolution of that peace treaty. He wants something big to celebrate this year. And the big goal for him would be to somehow negotiate a peace treaty to bring that Korean War to an end.